FIRST CONGREGATIONAL UNITED CHURCH OF CHRIST. Dubuque's oldest Protestant church in continuous service. From 1801 until 1848, the new churches started in America's west by Congregationalists and Presbyterians were founded together under what was called the Plan of Union. (1) Around 1833, a congregation was formed as a "missionary church in the wilderness." 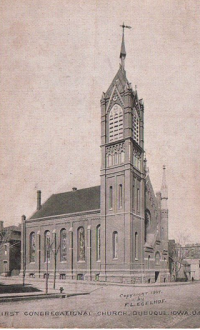 (2) This group of nineteen people, five men and fourteen women, placed the cornerstone for the OLD STONE CHURCH, their first permanent place of worship, built with the help of John KING east of WASHINGTON PARK. To illuminate the service, members brought their own candles. Lack of funds led the congregation to suffer foreclosure on Old Stone Church in 1844. The congregation worshiped in the Court House or a Baptist Church. 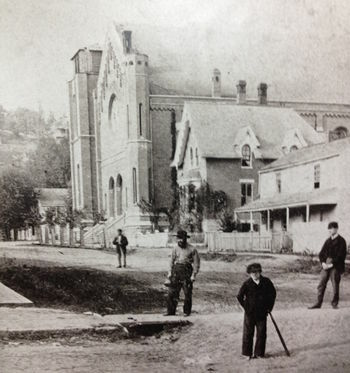 In 1846 the Main Street Church was completed at a cost of $3,500. (5) Increasing attendance led to the need for enlarging the building. This was done at a cost of $2,700. (6) Raising money required many activities. Reverend Holbrook, minister to the congregation, toured New England and collected over six hundred dollars. 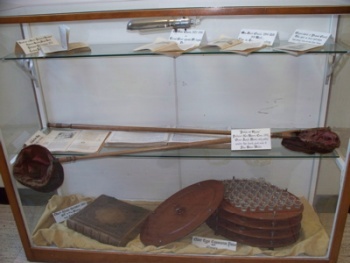 Church members turned to the American Mission Society for financial help and resorted locally to conventional and unconventional methods of raising money. The church sold or rented pews to the members. Annual rentals varied from twenty-five cents to over five dollars. Pews could be purchased for $37.50, and owners made annual payments or risked swift repossession. Rentals, assessments, and sales provided sufficient money to pay ordinary expenses allowing offerings to go to church causes. It was not until 1849 that the church became self-supporting. Collections during the service were made as the ushers passed velvet bags on long poles down the pews. The church soon purchased two lots, the site of the present church, for $1,250. Rev. Holbrook bought the easterly thirty feet of the two lots for the parsonage. Before work on the church was begun, some members expressed their feeling that the church was located too far north in the city. The trustees kept the two lots they had purchased, but also bought Lot 619 for $850. The church members finally decided to move. The single lot, across the street from Washington Park and next to the bluff, was sold and eventually became the location of the mansion built for Jesse P. FARLEY. 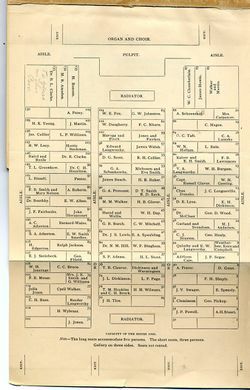 The cornerstone of the present church was laid in July of 1856. The financial PANIC OF 1857 left work on the church incomplete. Faced again with the threat of foreclosure, members chose not to sell the building but raise the $20,000 mortgage. Success was assured when a member, G. D. Wood, donated $10,000 in gold. 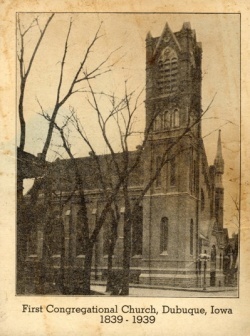 The first worship service at the new location was held in the Social Room on July 11, 1858. (7) A five thousand dollar loan was required to complete the sanctuary by April 1, 1860, when the church was dedicated with nine hundred people in attendance. The building eventually cost $41,000. (8) The rose window in the southern wall of the church is thirteen feet in diameter making it the largest window of its kind in the city. This undated picture by Samuel Root shows the stairs at the front of the church, home of Martha Baker, unfinished steeple, and the stepping stones which were installed on many corners to allow people to escape muddy streets. 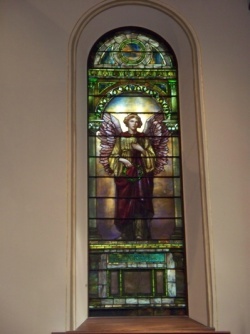 Eveline Deming Stout is remembered through one of the stained glass windows. Pews were rented and carried the names of many prominent Dubuque residents. In 1972 First Congregational United Church of Christ began construction of an educational building on the site of the former home of Martha BAKER. At a cost of $375,000, the new building provided over 11,000 square feet of space for Christian education, church meetings and administration. The building was dedicated on May 11, 1973. (29) The church ordained its first woman pastor, Elizabeth Pigg, on December 14, 1986. (30) and the church was the first in Dubuque and of United Church of Christ churches in Iowa to offer the STEPHEN MINISTRY to members. Workmen perch high above Locust Street repairing parts of the tower in 2014. 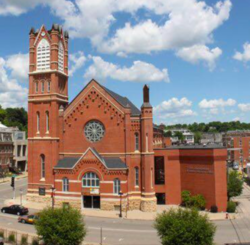 On May 11, 2014 First Congregational United Church of Christ celebrated its 175th anniversary. With the retirement of Dr. Ken and Nancy Bickel in 2015, a nationwide search began for new church leadership. The pastor chosen was Dr. Lillian DANIEL. 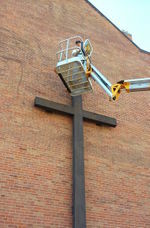 The year 2018 was one of mammoth construction projects around the church. Making the church more handicapped accessible had begun years before with the installation of a long sidewalk through the courtyard into the north side of the church. This allowed wheelchairs to be moved to the same floor as the sanctuary by avoiding steps. A chair was installed allowing access from the first floor to the social rooms. In 2018 a $650,000 capital campaign resulted in elevator being installed on the first floor which allowed access to the sanctuary and up to the third floor of the education wing. 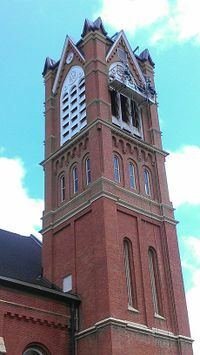 (39) Not only did this add substantially to the handicapped accessibility of the church, the elevator allowed the church's many bells to be moved from the sanctuary to storage during the week. 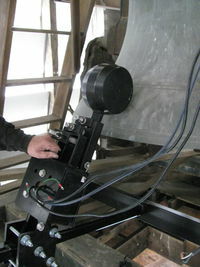 While the rope attached to the church's bell still worked, an electric ringing system was installed in early October. This page last modified 18 April 2019.